Are Yorkies Known to Be Nervous? Yorkies are brave, devoted little dogs. If you're thinking of bringing a small dog into your life, but don't want one with anxiety issues, the Yorkshire terrier may not be for the pooch for you. But don't turn away too quickly. 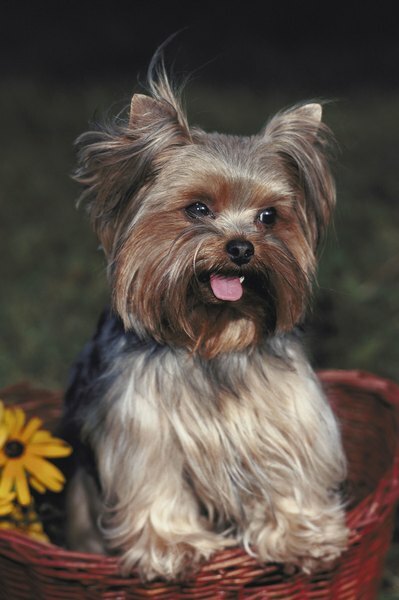 Yorkies can be nervous, but they are also brave little dudes, devoted to their person. While you might think of Yorkies as frou-frou dogs carted around by doting owners, that's not the original purpose of the breed. Don't forget they are terriers, bred to kill vermin. Back in the 19th century, Yorkies were working-class dogs used to kill rats in the mills of northern England. Because of their size and attractiveness, they soon worked their way through the class system, becoming cherished companions of the well-to-do. Nervousness in a Yorkie is an individual thing, not a breed thing. If it's a trait you want to avoid in your dog, purchase a puppy from a reputable breeder and ask to meet the parents. If the mother and father don't have nervous temperaments, it's a good bet their offspring won't either. Observe the litter to see which puppies appear outgoing and which are a bit shy. A good breeder knows her dogs, and breeds for sound physical and mental health. Although he's little, your Yorkie is a tough character. That terrier temperament means he's a brave, feisty dog. He can be quite independent, so if you want something strictly in the lapdog department, look elsewhere. For their size, they're good little watchdogs. While you can't expect a 5-pound canine to protect you, he'll alert you to any signs of danger. He's also inclined to take on bigger dogs if he perceives a threat. However, yapping -- uh, barking -- can be a problem with Yorkies. For best results, don't spoil him. Train him the way you would a larger dog. He's smart and learns quickly. While he's too small for young children to play with, he usually gets along with cats and other dogs, provided the other dogs know who's boss. A Yorkie doesn't require a great deal of exercise, making the breed suitable for apartment living. The long, silky coat needs regular grooming. While physical exercise can be met with a couple of short walks per day, mental exercise is another story. Play games with your dog, or take him with you on appropriate excursions. Yorkies aren't the easiest dogs to housebreak, but that should come with time and patience. Are Puppy Stairs Worth the Cost?